My son has been asking me for yogurt for a while now because his friends at school have it in their lunch. Since we don’t eat dairy or sugar I decided to go on a search for a healthy, non dairy yogurt for him to have. I was so disappointed to find that all the non-dairy yogurts are either full of sugar, soy and/or artificial flavors/colors. Not to mention how expensive they were, most range from $1.75-$2.75 each. 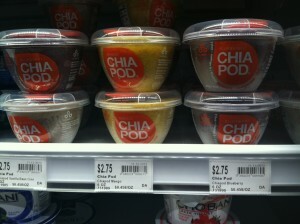 The other day I was at our local health food store and I saw a product called “Chia Pod”. It was expensive but it said it contained only 3 ingredients: chia, coconut milk and blueberries. I decided to buy one and give it a try. My kids loved it and wanted more! I personally don’t enjoy the goopy texture of chia (when it has been “bloomed”) but the taste was great. I thought, if this is just 3 ingredients, then I should just make it myself. So I blended 2 cups of frozen organic blueberries with 2 cups of coconut milk and poured the mixture into a glass container. I then added 4-6 Tbsp. of chia seeds to the mixture and placed it in the fridge to thicken overnight. In the morning I gave it to my children and they loved it! YAY! The next day I made a smoothie (1 cup. coconut or almond milk, 1 cup water, 2-3 dates, 1 banana, 1/4c. raw cacao, 1 tsp. spiralina, 2 Tbsp. almond butter and a handful of ice-Blend! ), poured it into a glass container and added 4-5 Tbsp of chia to thicken overnight. Again, the kids loved it! I now have a cheap non dairy/sugar healthy yogurt I can give my kids! It is high in fiber, Omega 3s and protein! Chia is such a great superfood to incorporate into your diet so if you are like me and do not like the “goopy” texture from chia (which happens when it sits for a while in liquid) then just toss them in your salad for a nice crunch, use them in your baking or just add them to your liquid and drink right away. -Chia seeds are rich in polyunsaturated fats, especially omega-3 fatty acids. The omega-3s in chia seeds can help reduce inflammation, enhance cognitive performance and reduce high cholesterol. -They are also an excellent source of fiber, with 10 grams in only 2 tablespoons. Chia seeds are rich in antioxidants. Two tablespoons of chia seeds contain 18 percent of the DRI for calcium, 35 percent for phosphorus, 24 percent for magnesium and about 50 percent for manganese. – A study published in the “British Journal of Nutrition” showed that chia seeds as a dietary fat source can lower triglycerides and cholesterol levels while increasing HDL or “good” cholesterol. – Chia seeds can play an important role in regulating insulin levels. They can also reduce insulin resistance and decrease abnormally high levels of insulin in the blood. -One ounce of chia seeds contains 4.4 grams of protein. -Chia seeds also contain all nine amino acids in proper ratios, making them a form of complete protein. This recipe is right up my alley!!! Such a cool idea to make your own yogurt. I also don’t love the jelled like texture of chia, but my kids enjoy it and when I make it into a warm pudding I actually don’t mind it either. Got to try it this way, there are so many ways to use it and as you said, it is so healthy. It is a little pricey, but a little goes a long way and compared to all the prepared foods this is much more economical. That smoothie sounds delicious. And if you can get your kids to eat chia seeds, you must be a genius! I recently tasted chia for the first time at a friend’s, she put them into a strawberry banana smoothie. I am not that into health food, but the combination was delicious. 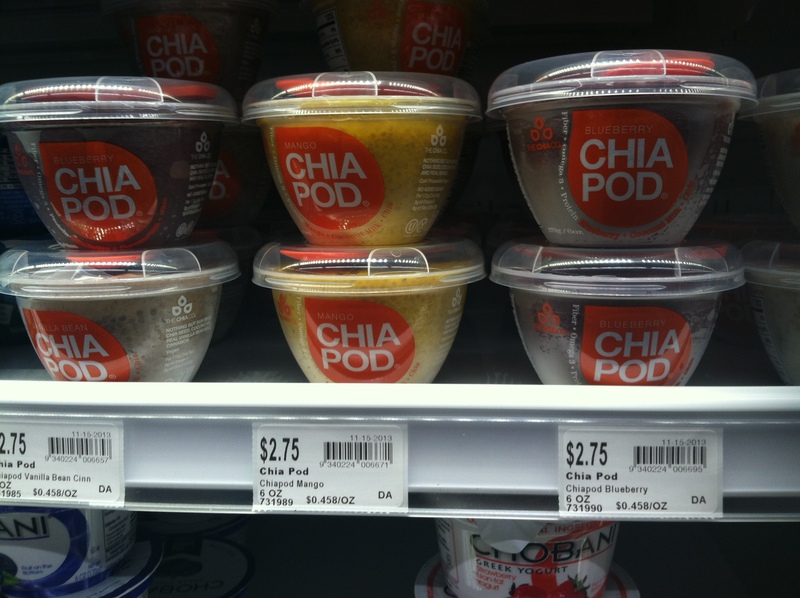 Thanks for posting about them, I’m going to give your chia yogurt a shot! I’m gonna try this! What’s Spiralina? http://amzn.to/1dha7JF This is a superfood and full of amazing nutrients! It is great in a smoothie. In 1 Tsp. it has 4g. of protein, B12, iron and calcium. There is equivalent to 7 servings of vegetables in terms of antioxidants content (beta carotene).It also has enzymes in it. how long do you think it needs to thicken? considering make it now for an afternoon snack for my kids when they come home in 2-3 hours. do you think that is enough time to thicken in the fridge? I love using chia seeds in baked goods, but I also don’t love the goopy texture. I saw those at Whole Foods too and they were just way too expensive. Great recipe!